Preheat the broiler with a rack about 4 inches from the heat. Line a sheet pan with aluminum foil and mist a wire rack about the size of the sheet pan with cooking spray. Snap off the bottom of one asparagus spear to see where it breaks easily. Line up the rest of the bunch and slice off the bottoms at the same spot. Place the trimmed asparagus on the prepared pan, drizzle with 3 tablespoons of the olive oil, sprinkle with ¼ teaspoon salt and ¼ teaspoon black pepper, and toss to coat. Arrange the asparagus in a single payer around the perimeter of the pan and set the wire rack on top, nudging the asparagus aside as needed so the rack lies flat and even. Blot the steaks dry with a paper towel. Season both sides with the remaining ½ teaspoon salt and ¼ teaspoon pepper. Place the steaks on the wire rack. While the steaks and asparagus cook, make the feta cream sauce: Combine the feta cheese, sour cream, remaining 2 tablespoons olive oil, and cider vinegar in a food processor or blender. Puree the ingredients until smooth. Add salt and pepper to taste and give the sauce one last pulse. Pour the sauce into a bowl and fold in the chives. Remove the pan from the broiler and allow the steak and asparagus to rest for 10 minutes on the rack. Transfer the steak to a cutting board before slicing it thinly against the grain. 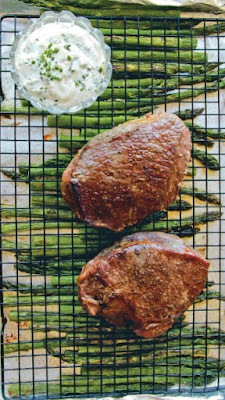 Serve the steak and asparagus with the feta cream sauce.